We have just launched a brand new dental website for our client in Calgary called Arbour Estates. The website has responsive design and is up to date with latest web technology. 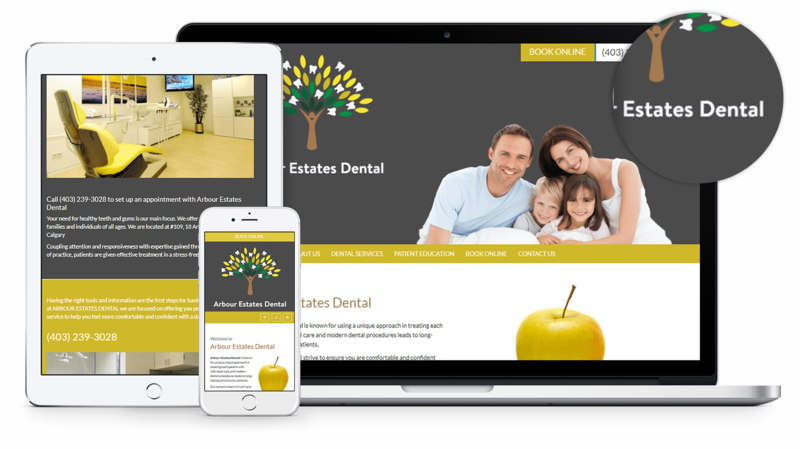 We are happy to announce the launch of a new website for Arbour Estates Dental! Arbour Estates Dental is known for using a unique approach in treating each patient with individual care and modern dental procedures leads to long-lasting solutions for patients. Their dynamic team will strive to ensure you are comfortable and confident with the complete oral health care you are receiving and will continue to receive. You'll always leave a lasting impression with a bright and confident smile. At Arbour Estates Dental in Calgary they help you claim and maintain a strong healthy smile to enjoy for your entire life. Patients have access to multiple images giving them a visual of the dental office. The attractive and simple banners let the eyes follow the important information with no restrictions. Patients can educate themselves through dental terms and they can browse for any dental services needed and make appointments just by completing a form online. The webpage has a very inviting layout, built for easy navigation and is compatible with all screens from any device such as desktop, tablet or smartphone.